Tom Hanks. Two words which conjure up images of "America's Dad." Personable and charming, Hanks has moments of power and command as a performer. He is considered one of the biggest box-office draws in the business, and, as a sideline, produces a whole lot of documentaries on American history. Despite Ken Burns. Born to working class parents of Portuguese and English heritage, Tom's parents divorced when the lad was only four. Living with his father, he was raised in an "evangelical" atmosphere, while retaining his right to be an unpopular geek at school. While in high school, Hanks' father remarried, to a woman of Chinese descent. Tom got a role in the school's production of South Pacific, and got the acting bug. Attending Chabot College, then Cal State in Sacramento, Hanks liked football, but liked going to plays — by himself — better. He got a thoroughgoing apprenticeship in the theatre by interning at the Great Lakes Theatre Festival in Cleveland, Ohio, for three years, excelling as Proteus in Shakespeare's The Two Gentlemen of Verona. Moving to New York City, Hanks got a role in the cheap slasher pic He Knows You're Alone (released in August, 1980). After doing some Shakespeare in the park type stuff, Hanks got a co-starring role appearing, sometimes in drag, on 37 episodes of Bosom Buddies with Peter Scolari, aired over ABC from November, 1980 to March, 1982. Hanks' tenue in televisionland was short. He did a guest shot on Taxi aired over ABC in April, 1982, played a doctor on Happy Days aired over ABC in November, 1982, and guested on Family Ties aired over NBC in January, 1984. After Happy Days, director Ron Howard cast Hanks in his hit film Splash (released in March, 1984) with Darryl Hannah. Suddenly, Hanks was a movie star. He veered into the orbit of Steven Spielberg rather quickly, starring in Spielberg's production of The Money Pit (released in March, 1986) with Shelley Long, then co-starred with Dan Aykroyd in Dragnet (released in June, 1987). Big (released in June, 1988) with Elizabeth Perkins, firmly put Hanks on the map. The film was both an artistic and financial success. He then played a struggling comedian in Punchline (released in October, 1988) with Sally Field. The 'Burbs (released in February, 1989) with Bruce Dern, didn't do well, and neither did Joe Versus the Volcano (which played the Chinese in March, 1990) with Meg Ryan. Hanks did his level-headed best in Brian DePalma's disasterous film of The Bonfire of the Vanities (released in December, 1990) with Bruce Willis, but you know, he picked right back up playing the manager of a girl's baseball team in A League of Their Own (released in July, 1992) with Geena Davis, and scored one of his biggest hits with Sleepless in Seattle (released in June, 1993) with Meg Ryan. Philadelphia (released in December, 1993) with Denzel Washington, brought him the Best Actor Oscar, and won the same award for Forrest Gump (released in July, 1994 — and played the Chinese in its IMAX® reissue in September, 2014) with Robin Wright, then starred as astronaught Jim Lovell in Ron Howard's Apollo 13 (released in June, 1995) with Bill Paxton. With a distinctive voice, Hanks launched a thousand franchises with his voicing Woody in Toy Story (released in November, 1995). After directing episodes of several television programs, Hanks made his feature debut with That Thing You Do! (released in October, 1996) with Tom Everett Scott, then finally appeared in a Spielberg film, Saving Private Ryan (which played the Chinese in July, 1998) with Matt Damon. 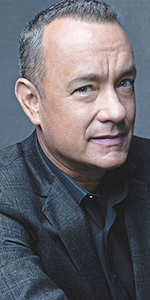 The Hanks hit machine continued, with all of his films finding delighted audiences: You've Got Mail (released in December, 1998) with Meg Ryan, Toy Story 2 (released in November, 1999), and especially playing prison guard Paul Edgecomb in The Green Mile (released in December, 1999) with Michael Clarke Duncan. As yet another personal best, Hanks reteamed with director Robert Zemeckis for the incredible Cast Away (released in December, 2000). In quite the shift, Hanks played a mob hitman looking for redemption in Road to Perdition (released in July, 2002), and a FBI man on the trail of Leonardo DiCaprio in Catch Me If You Can (released in December, 2002). He played Abe Lincoln, Daniel Boone, and Paul Revere, in seven episodes of Freedom: A History of Us aired over PBS in February, 2003, and worked for Spielberg once again in The Terminal (released in June, 2004) with Catherine Zeta-Jones. Hanks joined with Robert Zemeckis as practically the only performance capture castmember in The Polar Express (released in November, 2004), did the voice of "Woody" — get it? in Cars (released in June, 2006), and retemaed with Ron Howard for their film of The Da Vinci Code (released in May, 2006) with Audrey Tatou. He three-peted as Woody in Toy Story 3 (released in June, 2010), then starred with and directed Julia Roberts in Larry Crowne (released in December, 2011). He played multiple roles in Cloud Atlas (released in October, 2012) with Halle Berry, then began playing some more recent American heros: Captain Richard Phillips in Captain Phillips (released in October, 2013), Walt Disney in Saving Mr. Banks (some of which was shot at, and later premiered at the Chinese in November, 2013) with Emma Thompson, played the lawyer James B. Donovan in Bridge of Spies (released in October, 2015) with Mark Rylance, played Chesley "Sully" Sullenberger in Sully (which played the Chinese in September, 2016) with Aaron Eckhart, and played Ben Bradley in The Post (released in December, 2017) with Meryl Streep. Mann's Chinese Theatre, Hollywood, California. 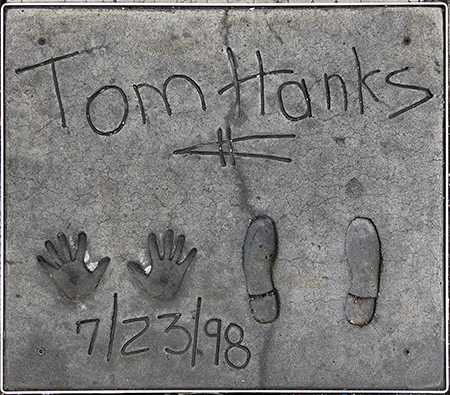 Tom Hanks Forecourt ceremony, Thursday, July 23, 1998. Tom Hanks gives and impish grin after dating the block of wet cement.